Seoul Selection is looking for translators to help us translate four books on Korean culture (food, modern art, animation and architecture) by the end of the year. We’d prefer translators with specialized knowledge about the topics or with experience translating works in those fields. The manuscripts are about 40 pages (A4) each. If this interests you, send a resume to atoz@seoulselection.com. A spectacular evening of fireworks and music. Don’t miss it. A favorite of Korean photographers, the Seoul International Fireworks Festival brings thousands to the banks of the Hangang River around and across from Yeouido for an evening of music and fireworks. Professional fireworks—both overseas and local—light up the night sky with dazzling displays of pyrotechnic beauty. Bring a blanket and bottle of wine riverside and enjoy the spectacle, preferably with someone you love. Many spectators head to Yeouido Hangang Park for the show. 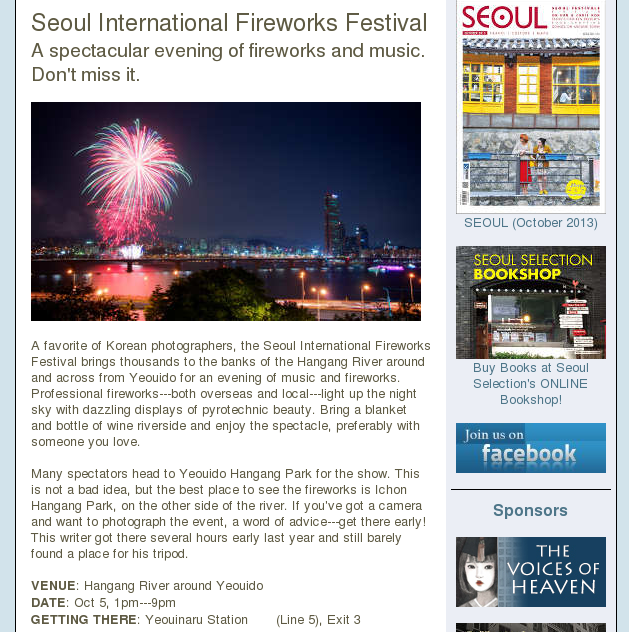 This is not a bad idea, but the best place to see the fireworks is Ichon Hangang Park, on the other side of the river. If you’ve got a camera and want to photograph the event, a word of advice—get there early! This writer got there several hours early last year and still barely found a place for his tripod. The brand new officetel URBAN 194 has got spiffy full-option studios for KRW 620,000—700,000 (no key money needed). Close to Janghanpyeong Station (Line 5). See here for more information. – Technology boosts opportunities to learn about Korea. – 10 icons of the Korean style world will get their due. – 100 years of the Korean diaspora. – Buddhist-themed art is easing troubled minds. – Gyodong Island seems like an interesting place to visit. – Beautiful sea of clouds over Gapyeong. – A great place to visit in autumn—Gochang’s buckwheat fields. – A preview of the Seoul International Fireworks Festival. – Dale stays at Mihwangsa Temple, one of my favorite Buddhist monasteries. – Yours Truly went to the port of Gungpyeonghang, Hwaseong. Every year, the SPAF challenges the conventional notion that performing arts is only for the supremely intellectual by inviting all who simply enjoy the aesthetics of art and crave something new and fresh. This year, a total of 19 entries—including ten foreign invitational works from France, the US, Belgium, Poland, China, and Japan—will dazzle the audience. The roster consists of eight theatrical works, seven dances, and four multi-genre productions. Some of the highlights include Victor ou les enfants au pouvoir from France, about a boy crying out at the absurdity of life and the laws of the society, and Zbrodnia (The Crime) from Poland, which tells a story of captivating mystery written by highly praised Polish novelist Witold Gombrowicz. King Lear, a joint production between Korea and Japan, is directed by Suzuki Tadashi, a living legend in Japanese theater history. Of particular note is Sontag: Reborn from the US, which is adapted from renowned author and activist Susan Sontag’s early journals. The Jarasum International Jazz Festival, held on Jaraseom Island in Gapyeong, is a large-scale jazz festival that attracts over 100,000 visitors every year. With fresh autumn air and the island’s colorful mosaic as a backdrop, the festival will invite some 50 acts from Korea and abroad. Headliners of the four-day annual event include Ibrahim Maalouf, Madeleine Peyroux, Erik Truffaz Quartet, Abdullah Ibrahim, and the Steve Gadd Band. The event will kick off with Jo Young Deok Trio, who won the Jarasum International Jazz Concours 2012. GETTING THERE: Namchuncheon-bound trains depart from Cheongnyangni Station, stopping at Gapyeong Station. Typojanchi is a biannual international exhibition of typography to explore various elements of the art as a visible language and a cultural discipline. Under the theme, titled “SUPERTEXT (Typography as Literature),” the 2013 edition explores the dual identity of typography, in the sense that it is as much an art of language as a visual art platform. Through exhibitions, seminars, workshops, and multidisciplinary performances, Typojanchi strives to share with the public the literary potential of typography in the overlap of the two realms. The Paju BookSori celebrates literature and its history with exhibitions, lectures, performances, and other public-oriented events like book fairs and flea markets. The annual book-themed festival is hosted by Paju, which is home to a cluster of some 260 publishing companies. The exhibition Hangeul Nadri 569 brings together materials drafted in hangeul in the early days of Christianity in Korea. The festival has invited celebrated Japanese poet Shuntaro Tanikawa, acclaimed Korean poet Shin Kyung-lim, and French columnist Guy Sormam. 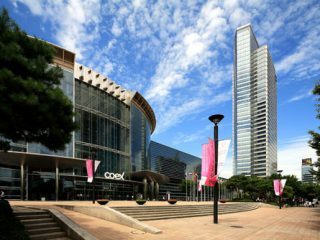 The BIFF, considered one of the most significant film festivals in Asia, is returning to Busan with 301 movies from 70 countries. Among them, 137 entries will record world premieres. Since its establishment in 1996, BIFF has focused on introducing and supporting new Asian directors and their films. Opening the festival will be Vara: A Blessing, which revolves around Bhutan’s traditional Bharatanatyam dance and tells the story of two lovers and their self-sacrifice through beautiful imagery. The 2013 Bhutani feature was directed by Khyentse Norbu. Today’s cultural excursion will lead us to Gongju, the previous capital of the Baekje kingdom during the three kingdoms period and Chungcheong province during the Joseon dynasty. The exursion will focus on some selected sights of Gongju, mostly related to Buddhism.Gongju was originally named Ungjin and became the second capital of Baekje from AD 475 to 538. In this period, Baekje was under threat from Goguryeo, the territory of today’s North Korea. Goguryeo had overrun the previous capital of Hanseong, modern-day Seoul, which forced Baekje to find a new center of strength. Gongju was the Baekje capital for only 63 years before King Seong retreated south in 538 and moved the capital to Sabi (nowadays Buyeo County). 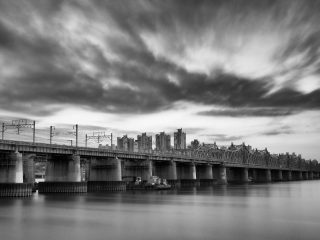 Hangang Railway Bridge in the morning. Photo by Robert Koehler.